Kermit 95 is Columbia University's communications software for Windows, with 40+ terminal emulations including DEC VT320 and below available over serial-port, modem, Telnet, SSH, and other kinds of connections, plus Kermit and XYZMODEM file transfer, scripting, and many other features, including a flexible key mapping mechanism, which allows (for example) the PC keyboard to be mapped to a DEC terminal keyboard. 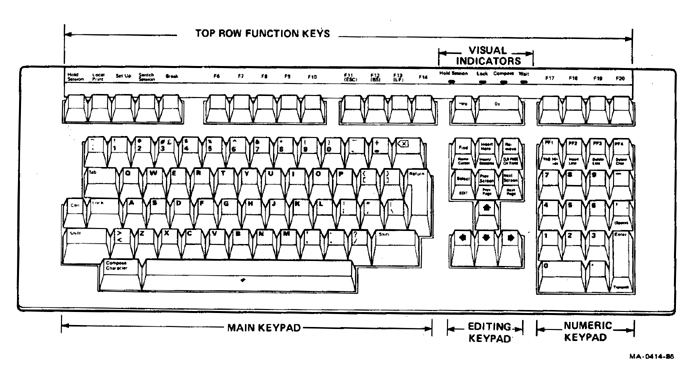 This page applies to DEC VT220, 320, 420, and 520 series terminals with the standard DEC LK201 keyboard. 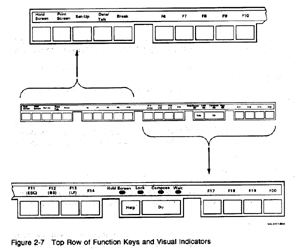 It does NOT apply to the DEC VT100 series, which does not have Function (F) keys. DEC VT220/320 (LK201) Keyboard (CLICK IMAGE to magnify). 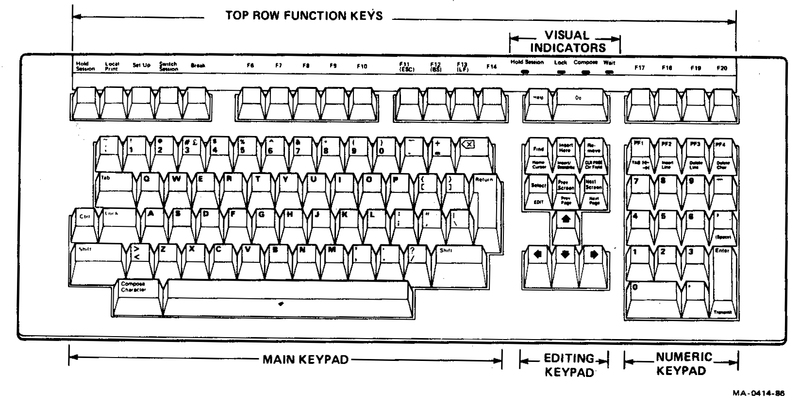 (CLICK IMAGE to magnify) A glance the DEC keyboard layout diagrams above and at left reveals that the DEC LK201 and IBM 101 keyboards are quite different, especially in the top row. Those who wish to map the DEC keyboard to the IBM one quickly find that the DEC keyboard has more function keys: 16 versus 12 on the PC keyboard. 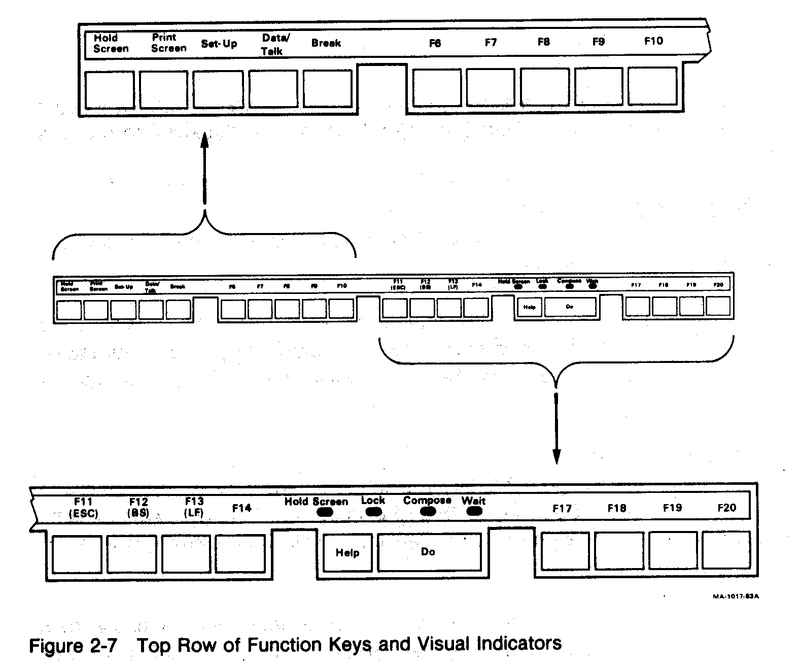 To confound the confusion, DEC's F-keys are labeled F6 through F20 (F1-F4 are only for local use) and DEC and IBM keys that have the same function (e.g. Local Print = Print Screen, Hold Session = Scroll Lock) are in different places. Keycodes may be written with or without a backslash prefix; \2420 = 2420. Kverb names are case-independent; e.g. \Kdecf15 = \KDecF15 = \kdecf15. Certain DEC F-key verb names have alternative spellings, e.g. \KDecF05 = \KdecF5. Certain DEC F-key verb names are synonyms for others, e.g. e.g. \KDecF15 = \KdecHelp. Shift-F-key combinations are reserved for DEC User Defined Keys (that is, for keys whose values can be defined by escape sequences sent from the host application). Of course you can redefine these too if you wish, as well as define Ctrl-F-key, Ctrl-Alt-F-key, Ctrl-Shift-F-key, or any other combinations you wish. Just use SHOW key to obtain the keycodes, or consult the TABLE. The first one stays in effect, even if you switch to another terminal emulation. The second applies only to VT220 emulation, and the third to VT320. \v(appdata)K95CUSTOM.INI Apply to all your connections. Dialer Entry Keyboard Page Apply to a particular connection. For complete instructions on key mapping, consult Chapter 7 of the Kermit 95 manual.